ICE agents successfully seize deadly drugs plaguing our communities, rescue victims from dangerous circumstances, and deport terrorists and other criminals from the United States. Background: Today, the House passed H. Res. 990, Supporting the officers and personnel who carry out the important mission of the United States Immigration and Customs Enforcement. 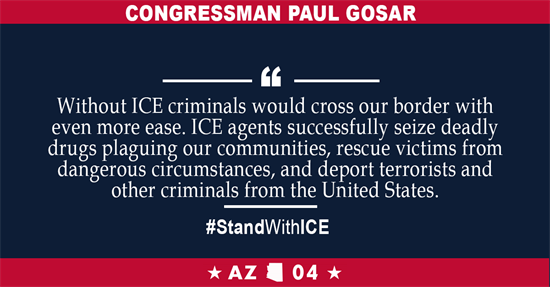 The resolution expresses the continued support of the House of Representatives for United States Immigration and Customs Enforcement (ICE) and the officers and personnel that carry out the mission of ICE. In FY 2017, ICE rescued 518 victims of trafficking and over 904 child exploitation victims were identified or rescued. ICE arrested 4,818 gang members, including 793 MS-13 members in 2017. In FY 2016 ICE Homeland Security Investigations arrested 1,952 individuals for human trafficking. From those arrests ICE was able to identify over 400 trafficking victims and provide them with the critical care they needed. Also in FY 2017, ICE seized 981,586 lbs. of narcotics, including more than 2,370 lbs. of fentanyl and 6,967 lbs. of heroin. Rep. Pocan (D-WI) introduced legislation (H.R. 6361, the Establishing a Humane Immigration Enforcement System Act) to abolish ICE. This bill would eliminate the agency responsible for stopping and detaining terrorists, identifying and rescuing victims of human trafficking and child exploitation, and seizing hundreds of thousands of pounds of illegal narcotics each year.